Love is just beyond your comfort zone. The Somewhere In-Between collection is the perfect box set of standalone dystopian and paranormal romances. 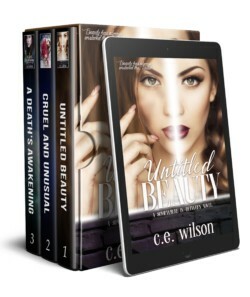 In this set you will find Untitled Beauty – a world where beauty is all that matters, Cruel and Unusual – where a man’s loneliness may be the most painful sentence of all, and A Death’s Awakening – about a sickly girl’s encounter with death, and how she falls in love with him.